Happy Holidays! Convene v2.10 for iOS and Android has arrived! We've introduced a variety of exciting new features to our mobile apps, and they're available right now! Session Reminders: Now Convene can remind you that your next session is about to begin! Simply favorite a session, and Convene will alert you a few minutes before your next session starts! iOS 9 support, support for iPhone 6s/6s Plus 3D touch - Peek & Pop on almost everything! Press with a little bit of pressure ("3D touch") on a session to Peek and quickly view the contents of a session, add a little more pressure and the view will Pop into place. Error Message improvements - Improving on an error message, a feature? Totally. We'll help you pin-point common issues, like with the internet connection and WiFi with better messages. Name display preference: Want to see names like Last Name, First Name vs First Name Last Name? Set your display preference in the account menu. 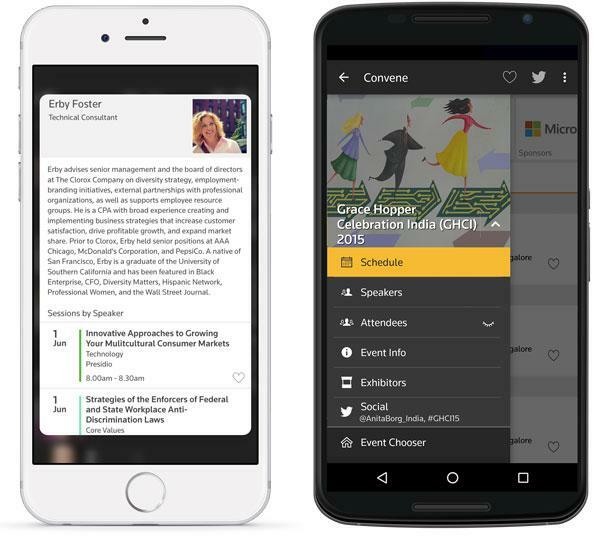 Sponsors/Exhibitors - For organizers, we've improved the appearance of sponsors/exhibitors in the app! No need to add a border or any padding. Simply upload the sponsor logo and it'll appear perfectly in the app! Performance enhancements and bug fixes - We’re always working to optimize Convene so it’s as fast and stable as ever! An easier process to update Attendee Names when needed.